HIGH Worrying about the mental well-being of a videogame character because I had to go to work. LOW It’s maybe not the best choice for an extremely busy person. WTF Death due to head being stuck in window. Life is pain. Anyone who says differently is selling something. Moments of anguish and grief can come instantaneously. How one reacts to these moments may dictate the rest of their existence, and in these moments, we all probably need someone to talk to. Depending on the type of person or the stage of grief, they may need a cheering on, a chewing out, or maybe they just need someone to listen. The person in need right now is Quinn, the protagonist of STAY, a new adventure game from Barcelona-based developer Appnormals Team. While Quinn is the focus, STAY posits with the idea that he’s a real person interacting with the player in their real life. The game even says “co-starring YOU” during the opening credits. 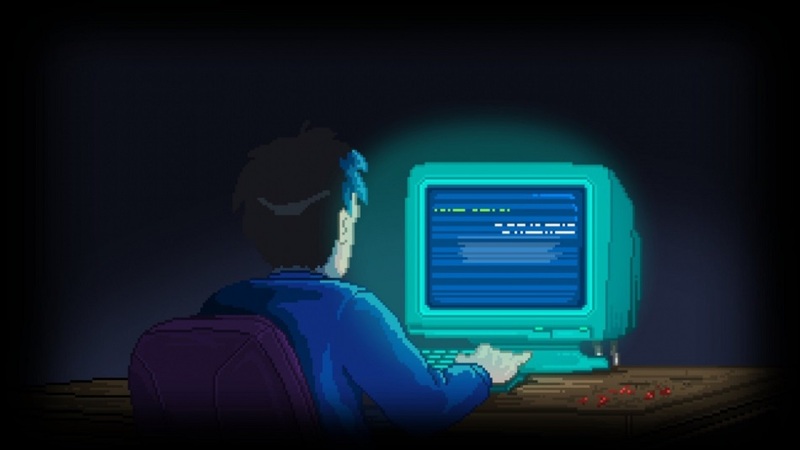 Quinn has been abducted and locked in a house full of traps and puzzles by an unknown assailant, and his only means of communicating with anyone is a computer (and later a phone) featuring a chatroom that the player happens to populate. 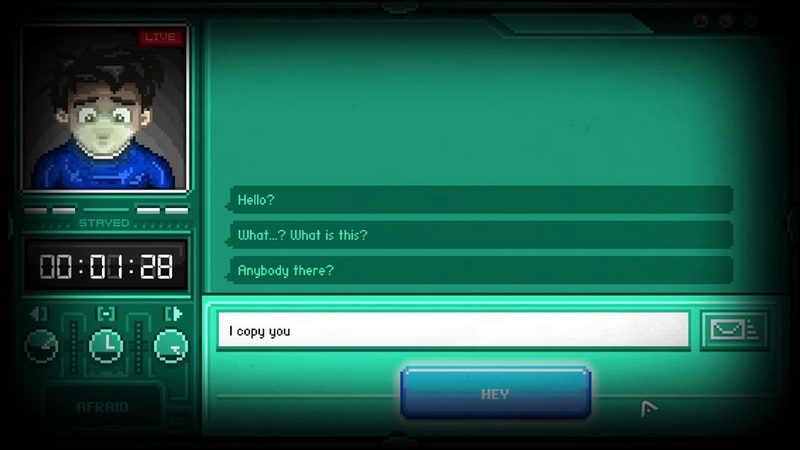 While Quinn can be controlled directly during the various puzzles he encounters, most of the game is spent in this messaging app of sorts where he talks to the player, asks them questions and for advice on how to proceed, and, when enough trust is built, eventually lets them into his life learn more about his struggles. Those struggles come from a very real place, as STAY tackles mature themes such as loss, abandonment, substance abuse, and how to cope with them. Quinn has some demons that will be discovered throughout the story. He’s intelligent, funny, sarcastic, a little emotionally broken, and always corrects his grammatical errors. It really is quite remarkable how the team was able to create such a complex character through (essentially) texting and a live camera feed of his face. I suppose the ‘texting genre’ is now a thing alongside similar releases like Bury Me My Love and Lifeline, but this is a meatier experience compared to those, and the hook that makes STAY shine is how it uses real-time. The moment the player begins, two timers start — one for time spent with Quinn, and another runs when the player is away from the game. Quinn doesn’t care if someone has errands to run, or a job to do in real life. He’s all alone, and he needs help. If the player doesn’t engage with him for extended periods of time, Quinn won’t be as trusting, he may not bond with the player, or he might even be dead the next time the console is turned on. Stay actually requires an online connection and saves automatically after every text, so there’s no cheatin’, folks. This leads to, frankly, one of the most tension-filled game experiences I’ve ever encountered. From the moment I started playing until the moment I finished, Quinn was constantly on my mind. Anyone who’s ever experienced having a friend in serious need knows how that can be taxing for both parties involved — when I went to the supermarket to get groceries, I was worried. When I cooked said groceries, I felt guilty. Sometimes Quinn will leave to do some exploring on his own, and I had to wait until he came back and hoped he didn’t go down the wrong path. 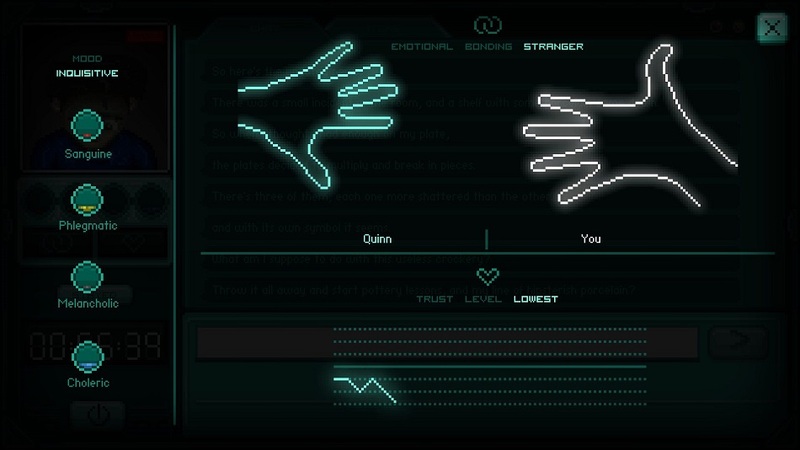 The character dynamic in STAY is unlike anything I’ve ever played in a game before, and rarely have I felt so connected to a character. Through STAY‘s 24 chapters, Quinn will encounter various puzzles that unlock another part of the labyrinth he’s trapped in. They’re all well designed, and while some are a little rudimentary (such as reassembling a broken plate) many will prove to be a real challenge, may require a pen and paper, and have fairly ingenious solutions. However, these puzzles highlight my one true issue with the game, and it stems from playing on consoles — the gamepad controls are bad. The sticks seem to switch at random depending on the puzzle, and the cursor moves excruciatingly slow at times. It’s quite clear that STAY was designed for a mouse and keyboard, and while the Xbox version is serviceable, playing it on a PC would be definitively the preferable option. Disclosures: This game is developed by Appnormals Team and published by PQube. The game is available on PC, Mac, and XBO. This copy of the game was obtained via publisher and reviewed on the Xbox One X with a HDR certified 4KTV. Approximately 11 hours were spent in the campaign, and the game was completed twice. There are no multiplayer modes. Parents: According to the ESRB, this game is rated M for Blood, Violence, Strong Language, and Suggestive Themes. STAY is a game that touches on some serious and potentially triggering emotional themes, but it’s handled extremely well. If I had a mature teenager and they were interested in playing it, I’d probably be ok with it, but I would consider having a discussion about loss and grief with them first. Deaf & Hard of Hearing Gamers: The game’s story is told entirely through text and is very readable, and there are no sizing or color options for it. It’s fully accessible. Remappable Controls: This game’s controls are not remappable. There is no control diagram. Due to the nature of the game, fast reflexes are never needed. The left analog stick and the A button are used to select dialogue options, while in puzzles the right analog stick is used to move the cursor. Control assignments change throughout puzzles, and it is occasionally difficult to decipher how to control them because the game never specifically outlines the controls for each scenario. Jarrod's had a busy couple of years. In search of a dramatic change of pace, he sold everything he had (including 950 videogames) and shipped off to Asia where he's taught English and lived in Cambodia, Vietnam, Japan, Thailand, and now China. He still loves his games, priding himself in his varied taste and playing everything from Disgaea to Madden. After getting a taste of the glitz of Beijing last year working at a Chinese mobile game developer, Jarrod went back to teaching and currently works in Qitaihe, Heilongjiang provide where the weather is cold and the noodles are poppin'. Jarrod used to write for sites like GamesRadar where he had the esteemed pleasure of reviewing Wii ports and PS Move launch games for peanuts. After a multi-year hiatus, he is happy to get back into reviews with GameCritics. ...He read the site as a kid, which should make Brad, Mike, and Daniel feel old as hell, considering he's almost 30.